Here is a set play from the Golden State Warriors used during the preseason game against the Timberwolves in China. 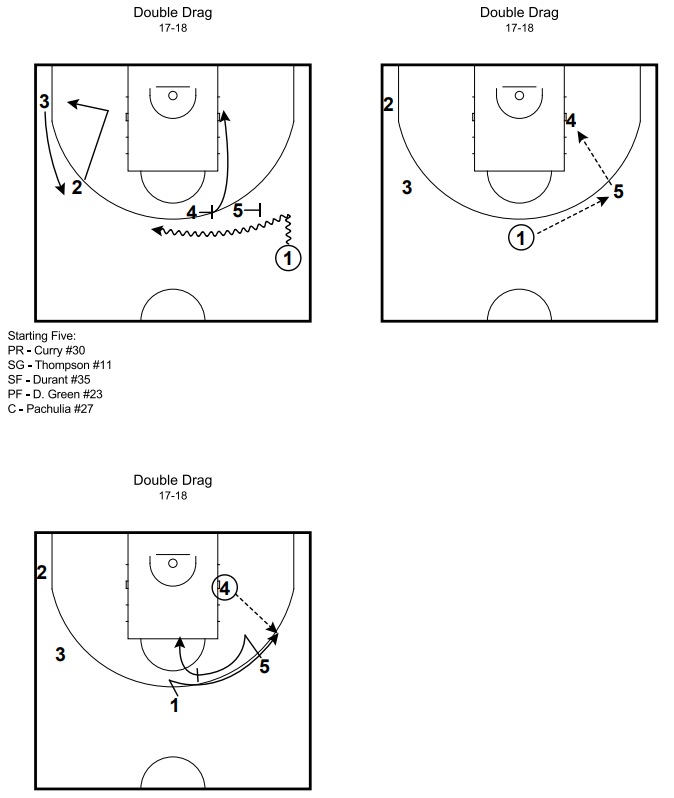 The play starts with a double drag action and ends with a post feed. Once the ball is in the post, the Warriors use a top screening action to occupy the defenders and also open up a shot if the post player doesn’t have a scoring opportunity. Here are two plays from the Boston Celtics during the NBA pre-season. The first is a screen-the-screener play in which the ball gets thrown to the post and Tatum cuts off of a down screen for a 3-point shot. The second play is a simple hi/lo look with four players out on the perimeter to clear space for Tatum to post up inside. Here is a quick after timeout set used by Italy against Ukraine in Euroleague play. It starts with a quick up-screen (which the point guard can look at 4 for a lob) and then an in-screen for 3 to catch on the wing. from here, you have several options: 1) 5 can clear out and let 3 work one-on-one, 2) 5 can post up inside, or 3) 5 can set a ball-screen for 3 on the wing. This play starts the same as “Post Back”, with 2 cutting to the corner, 1 screening for 5, and the ball being reversed the 1 on the right wing. This time, 4 screens for 3 and 3 makes a hard cut to the rim. If 4’s defender jumps ahead of the screen thinking that 4 will be screened by 3, 2 can move in from the corner and set a flare screen for 4. 5 passes to 4 for a shot on the wing. 2 cuts to the ball-side corner. 1 screens down for 5. 2 sneaks in from the corner to set a flare-screen for 4. 5 passes to 4 for a shot. The play starts in a 1-4 high with 1 passing to 3 on the wing and 2 cutting to the opposite corner. 1 screens down for 5 then pops out to the right wing. 3 passes to 5 who reversed the ball to 1. 4 screens for 3 who cuts into the lane and then turns around to quickly screen for 4. 1 looks to pass to 4 cutting to the rim. 4 sets a screen for 3. 1 dribbles right as 3 sets a screen for 4. 1 looks to pass to 4 at the basket for a lay-up.